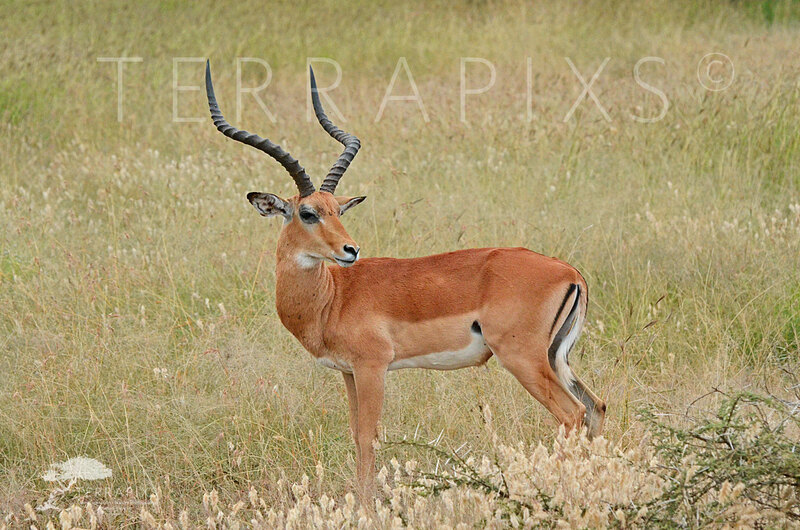 There are a number of species of antelope in Africa but none are so plentiful as the Impala (Aepyceros melampus). First described by a German zoologist in 1812, there are two subspecies recognized. These are medium sized animals that can and do run very fast. Males have a characteristic set of horns and are sexually mature after one year. Mostly active during the day they occur in groups or small herds, particularly during mating season when a male impala can have a dozen or more”ladies” to tend. Gestation lasts 6-7 months. Females give birth to a single calf that is immediately hidden to avoid predation. Impala are herbivores, browsers (feeding on tender twigs and leaves) and grazers (feeding on the rich savannah grasses). Either way, they make a great meal for the many African predators such as lions, cheetah, leopards, etc. But they have to catch one first and impala are fast, really fast and have keen eyesight and hearing. The male impala in the picture had a harem of 10-15 females at the time I took the picture. As you can see, he was quite a beautiful animal….and he knew it! We were in Serengeti National Park in Tanzania when I spotted him just getting up from his mid-day nap, all his ladies close at hand. He is a beauty…..Enjoy!